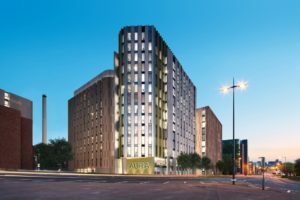 Student flats like for example Aura (Liverpool) give the investor a guaranteed net yield of 8-9%. Student flats have become immensely popular in the last 15 years. Not surprisingly. For students, they mean a convenient place to stay near the university and near fellow students.It means a competent management and common facilities. For investors, they represent a stable income in a hassle-free environment, without the problems of your own “buy-to-let” real estate. It even allows you to invest cross-border without ever visiting your property. The trend actually started in UK about 15 years ago, when single rooms were offered by developers to investors with low entry level budgets and little ambition to manage their own properties. The same is valid for other countries too. As long as local regulations and tax permitted, the model was copied in many European countries, where investors have been moving from cash-intensive, tax-intensive and hassle intensive residential flats to the more easily managed student flats. That does not mean that investors get the same good deal in every country. The returns expected in newly built student housing reflect quite closely the returns expected in the local residential market. Often investors will receive a premium of 20-30% net rental income to compensate for the lower liquidity of the asset and the lower chance on capital gains. The aftermarket of student flats (investors) is much smaller then the aftermarket of city center residential flats (for residents). The sales value is in line with the increasing student rental fees, not with speculation frenzy in certain areas or cities. The trend has started in England, but is gaining momentum. Primarily for tax reasons: the UK government is gradually increasing the cost for (UK based) investors that used to pour their money into residential housing. And of course the hurdle to invest 50-80.000£ is a lot lower then a residential flat of 150.000£. Let alone a London apartment of 700.000£. A few young management companies like Urban Bubble or Unite Students are riding this wave and are growing fast to manage this ever growing collection of dedicated student houses. 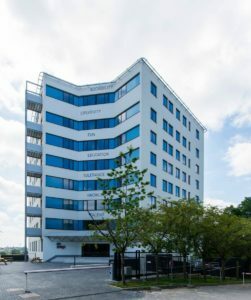 Upkot Brussels – Student flats in belgium give an expected rental return of 3-4%. As we know the situation in both Belgium and UK, we have been comparing the offer to investors in both countries. In our experience, most European (Euro-zone) countries do look more like Belgium. The base: rental value. Finding out rental values is easy. Most of them are simple published on the web for any given city. On the website of the management companies, you can easily find going rates and conditions for the students. Deduct common costs and management fees and you can easily find out the going net rental income for student pods. It turns out that UK students have to fork out a monthly sum of 500-700£ (130-200£/week). Belgian students can find the same accommodation for no more then 350-400€ per month. Annual real estate tax (+/-700€) Legal fees £1.000. Looking for student flat investment? Apply for more information. So, what are residential prices doing in UK? How to get an idea of the expected capital gains in UK residential real estate. A Crystal ball is not very helpful. The internet however, has massive information available.